Beethoven composed his Clarinet Trios op. 11 and 38 in 1798 and 1802-03. The op. 11 was given the nickname “Gassenhauer Trio” because its third movement is a set of variations on a theme from Joseph Weigl's opera L'amor marinaro (“Gassenhauer” means a “popular song”). 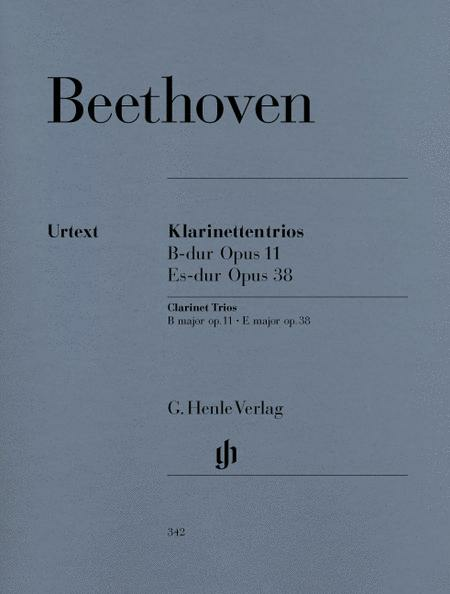 Playing with many possibilities in these nine variations, Beethoven sometimes lets the piano appear alone, and sometimes has it rest. In places the mood is that of a sort of funeral march, and there are harmonic and rhythmic surprises throughout. The op. 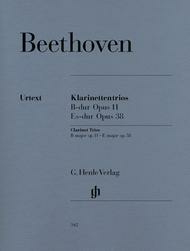 38 “Grand Trio”, the later of the two, was a reworking by Beethoven himself of his op. 20 Septet. He provided – as also in the case of op. 11 – an alternative violin part, in order to give the work broader distribution and thus greater popularity. The violin parts are likewise included with our Urtext edition, which – just as back then – makes it doubly valuable.